It is time to present the results of our tests. In the chart below we present the filters’ ranking according to the points they achieved in all the categories. The first three winners will definitely be a surprise for most experienced photographers (as they were for us). Three of the top four filters are manufactured by the same firm – Hoya – which handily took first and second place. The very popular and famous MRC B+W filter was only able to gain a third place finish. The key to success appeared to be good UV ray reduction and high transmission in the visible light range. The Hoya products performed the best in this category. We definitely have to add that there couldn’t be any mistake or any subjective evaluation. Most points in our test were accumulated solely based on the parameters that were measured by the spectrophotometer, which obviously is an objective and precise piece of equipment. And the fact that the filter that costs only 79 Polish zloty earned the highest number of points is very reassuring! As far as the B+W filter is concerned we need to mention that this company offers products targeted mostly at the 415 or 420 nm radiation wave. Unfortunately, we weren’t able to find these filters from any Polish distributor and therefore we couldn’t test them. We were very disappointed with the Heliopan products. The German filters are not only very expensive, but they also presented very mediocre optical parameters. We were also surprised with the low 8th position of the WPC coatings used by the top model Marumi filter. Although this filter has the highest light transmission in the visible range and has a very small tendency for flares, it only barely blocks the UV radiation, which should be its primary function after all. Why would we need a UV filter which cuts out the same amount of UV radiation as a regular glass? However this filter can be useful for people, who want to protect their lens from the outer factors. Thanks to its visible range features, it will pass this part of the exam perfectly. The Tiffen filter was particularly unfortunate in our testing. It costs almost as much as the winner – the Hoya HMC – and it performs a bit worse than a clean piece of regular window glass! We regret that we weren’t able to get the best products from this company. We can only hope that those would do much better. We also would like to mention that we couldn’t be more objective as far as the Slim type of filters are concerned. This is because of our testing procedure, in which we used the equivalent of a small frame 25.5mm lens. The Slim filters start showing their superiority when we use the 24-28mm or shorter focal length. The border here is pretty flexible since it depends on the lens mapping (you will find more information about the mapping later in this article). However, the typical lens has a much longer focal length and our test shows that it doesn’t make sense to pay extra for this kind of filter if our lens doesn’t need this feature. We weren’t surprised by the results of this test. If the general test’s winner is the 79 Polish zloty filter there isn’t anything better than that in the cost-to-benefit analysis ranking. The Hoya Company can be very proud of its products in this category. They occupy the first four places. Readers would make a very good choice by buying one of them. There is one more question to answer. Are the test results relative to different diameter filters? Not really. We will definitely see the difference in vignetting and flares. But if the manufacturers, in a certain filter series, use the same kind of glass and the same coatings (and we have no reason to think they don’t) the results in a transmitting category can be easily extrapolated over the many other diameters in a certain series. This is very reassuring since in many cases this is the most important category. 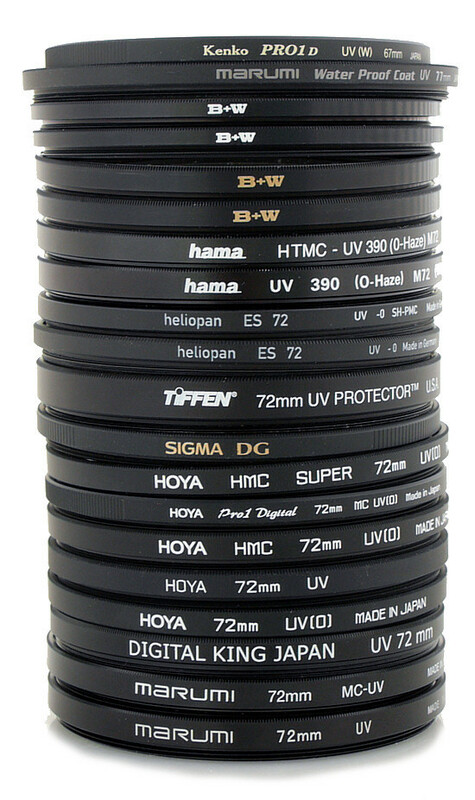 When choosing the smaller diameter filters we usually use them on smaller view angle lenses. Smaller view angles mean smaller radiation falling angles towards the optical axis and this means smaller vignetting and smaller flares. The categories for smaller filters, whose results cannot be extrapolated, become less significant. The results in the transmission category can be extrapolated, which makes our test valuable for everybody who is considering buying a particular filter. Practically speaking, we could finish our testing right here. It is, however, worth adding a few words about proper filter use. In the Internet forums we find lots of complaining about the Hoya filters, i.e. that they are difficult to clean or that B+W products are very easy. We weren’t able to check it while testing the filters since our agreements with the stores, which provided the filters for the testing, say we have to return the filters in mint condition. If we wanted to do such a test we would have to make it dirty first (with our fingers for example) and then try to clean it. We decided to do something else. The filters, except for being smudged by fingers, are often splashed with dirt. We managed easily and non-destructively to put a couple of drops of water in the filter glass and then we tried to clean it. This easy test proved the Internet user claims that the B+W was easy to clean – after wiping it with a clean cloth for a couple of seconds, the filter looked like new. If we spend a bit more time cleaning we can do the same with the Marumi, Heliopana SH-PMC, Kenko filter or most of the Hoya (HMC, HMC Super i Pro1 Digital) filters. We also spent a fair amount of time cleaning the rest of the filters. The only one we weren’t able to clean — even after a long time wiping it with a clean, dry cloth – was the Hama HTMC filter. Our test showed that the Hoya filters (except the Standard version) were quite easy to clean. We have to stress that the dirt was only a couple of drops of water. We have no idea how the filters will deal with other kinds of liquids. But no matter what kind of filter we use, users must understand that they will get dirty eventually at some point. We have to remember that the filter’s antireflective coatings are one hundredth thinner than a single human hair. If someone advises you to grandma’s old-fashioned way of cleaning (i.e., dish washing soup and dish towels) you can be sure that even the best filter will probably turn into the regular window glass after a couple of such “baths”. In summary, we would like to add that our test is not an oracle. The testing categories, the way of choosing the categories, the point system, etc., are just our propositions. The criteria and the appraising methods are shown in the chapters above. In the next chapters you will find each filter described individually and the points we gave it. This is also great material for those who like to experiment with their own tests, scales and rankings. 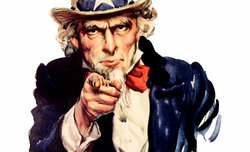 You are more than welcome to use our data. Since you are the ones who will buy the filters and use them, you deserve to be satisfied with the product that you choose.